With the increase in artificial and inorganic substances in our living and work spaces, people worldwide have turned to flowers and plants to bring peace of mind. The Sogetsu School of ikebana, founded in 1927 by Sofu Teshigahara, believes that anyone can arrange ikebana anywhere -- a kitchen table or living room, a shop window or hotel lobby, or even a large, open public space -- and with almost any material. Although not every school of ikebana embraces the use of Western floral or non-floral materials, the Sogetsu School is known for its willingness to explore new ideas. Sogetsu encourages imagination and individual creativity. 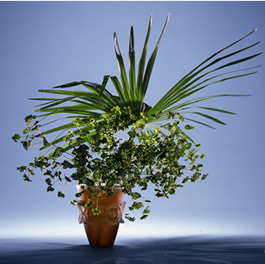 The Sogetsu philosophy also advocates that ikebana should be part of a lifestyle rather than considered an exclusive aspect of Japanese culture practiced only by a limited number of people. Today there are 47 branches of the Sogetsu School in Japan and more than 100 branches in other countries. Now under the direction of Akane Teshigahara, Sogetsu School's fourth Iemoto (Grand Master), the school seeks to stay in tune with the times and continue to explore the boundaries of the field of contemporary ikebana in Japan. As the daughter of film director Hiroshi Teshigahara (the third Iemoto of the Sogetsu School), she approaches her art form with intense creativity and a lively spirit that inspires her students worldwide. 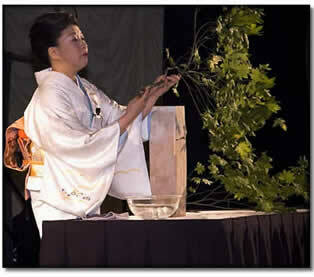 Please consider exploring the world of ikebana with the Sogetsu School in Portland. Please contact us with any questions or you can contact our director, Leslie Dolin, or any one of the teachers listed at this website.